I grew up eating it. My grandpa grew it in his huge garden and so did my dad. Every spring my mom would make giant amounts of rhubarb cooked with a little sugar and lemon juice. We ate it by the bowlful, spread it on toast- we ate it on just about everything. My mom makes a scrumptious rhubarb cake- oh so good. It is also wonderful in crisps, cobblers, and pies. I always get excited when I see rhubarb and realize that it is in season. I bought a bunch and then the hard part was deciding what to do with it. 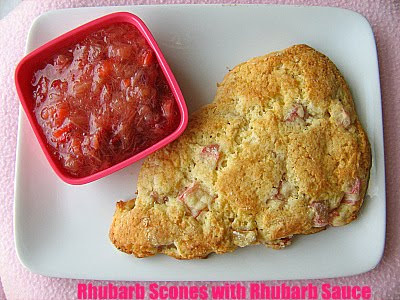 I saw a recipe in Everyday with Rachael Ray magazine that featured biscuits with "rhubarb jam". 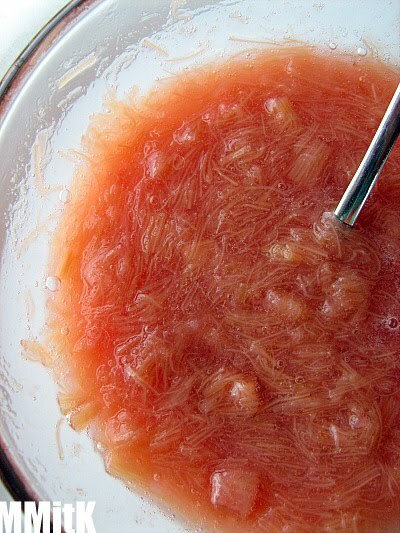 The rhubarb jam was basically the same thing that my mom makes all the time, but it had quite a bit more sugar. I didn't want to make the biscuits that were featured with the recipe, mostly because I made some cream biscuits a couple weeks before and wanted to try something else. I thought about my mom's cake or muffins, but then I saw Bridget's scones, (she is pretty much the queen of scones) and they looked amazing, so I made those. I have made multiple scones from her site, so I knew they would turn out perfectly. I made these scones while my mom, dad, and younger brother were visiting from Utah and they were loved by everyone. They disappeared in minutes! I really miss having a teenage eater around. I reduced the sugar in the rhubarb jam and added some chopped strawberries, so that more people could enjoy it. And because I found some beautiful strawberries. If you have never tried rhubarb- I recommend giving it a try. It is really so versatile and delicious! In a medium nonstick skillet, combine 1/2 cup water, 1/2 cup sugar and the lemon juice over medium heat. Cook, stirring, until the sugar dissolves. Add the rhubarb and simmer until very thick, stirring to break up the rhubarb and scrape the skillet sides, about 10 minutes. Transfer to a bowl and let cool. I adore Rhubarb, like you I grew up with it. My mom used to make so many different things with it as well and to this day it is one of my favorite vegetables. Can't wait to go to the farmer's market and buy some so I can try this recipe. I have a new blog on a related topic at kilbeyskitchen.com. I was thinking that it would be beneficial for both of us to exchange blogroll style links. You can contact me at kilbeyskitchen.com/about. That jam is beautiful! I love the texture. You know, I haven't made scones in months. It's like 2009 was the Year of the Scone for me, and as soon as it ended, I stopped making scones. I want to try some new recipes, but I still have croissants and whole wheat brioche in the freezer too! Strawberry Rhubarb pie is my favorite! Yay for spring and rhubarb! These look so lovely - I wish I had one right now! I just LOVE rhubarb Mary Ann! These scones look fabulous! I was thrilled to discover a small patch of rhubarb at the end of our new garden here in Chester! I'll have to give your tasty looking scones a try!